What’s best: the Audeze LCDi4 (US$2495) or the Noble Audio Katana (US$1850)? The answer depends on who is asking. For the indoor listener with no-one to disturb with an open-backed planar, the choice can fall to sound quality alone — the LCD-i4 — but for the everyday train/plane traveller, the open-backed design of the Audeze is a no go. We need an IEM that won’t leak sound and will simultaneously passively isolate us from external noise intrusion — the Katana. Best is more than a simple matter of ultimate sound quality. Our predominant listening environment matters. What’s best: the KEF LS50 (US$1499) or the ProAc Tablette 10 (US$1900)? The answer depends on who’s asking. For the electronic music fan, the KEF’s extra heft and wallop will more likely satisfy. For those putting humans at the centre of their music, the ProAc are uncannily talented in clearing additional space around vocalists. Best is more than a simple matter of subjectively loudspeaker performance rating when that subjective loudspeaker performance rating might vary according to music taste. What’s best: the Spendor A6R (£2500) or the Spatial M4 Turbo S (US$1995)? The answer, again, depends upon who is asking. For the traditional box speaker fan, the Spendor might tick the necessary boxes, sound quality included. For the listener seeking something a little less ordinary, the Spatial might be the horse to back: open baffle, available in high gloss white or red and a better aesthetic fit for those with lounge rooms kitted out by way of IKEA. For the Future-Fi fan, the Spendor’s better sound quality (should it be the case) come to naught because of two simple words: looks matter. What’s best: a used PS Audio PerfectWave MKII (US$3999, discontinued) or the Schiit Gungnir Multibit (US$1249)? Both companies have pedigree in the DAC design game. Schiit now favour Mike Moffat’s closed form filter that retains all original samples. PS Audio once put their marketing muscle behind the Native X (Digital Lens) digital input board that buffered and re-clocked all incoming signals irrespective of input. I’ve reviewed both but three years apart, eliminating the possibility of a side by side comparison. Let’s assume the Schiit has the SQ edge. The PS Audio box then counters with a full colour touchscreen, remote-controllable 32-bit digital volume control and rear-facing slot for hosting PS Audio’s Network Bridge streaming board to connect streamer to DAC via internal I2S bus. The Schiit demands an outboard streamer with associated USB or S/PDIF cable connections and, perhaps, external re-clockers. The idealist will likely stick to the Gungnir but for the digital audiophile looking to maximise convenience and minimise box count (and after-market futzing) – we’ll call him a pragmatist – the PerfectWave is probably the more suitable choice. What’s best: the Chord DAVE (US$10,588) or the Aqua Formula xHD DAC (US$16,500)? Both are statement units. 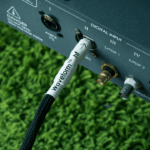 Both offer a variety of inputs with the Aqua going one step further into uber-audiophile territory with an RJ45 I2S input. Both manufacturers take the path less trodden with D/A converting circuitry: Chord with FPGA + Rob Watts’ WTA filter code and Aqua with in-house designed R-2R boards and optocoupled boards. I’ve heard the former but not the latter. For the sake of argument, we’ll assume the single-purpose Italian to be the superior sounding of the two flagships and that it more than comfortably earns its US$6000 price premium over the Brit (even though in reality this might not be the case). For the idealist seeking (one designer’s take on) ultimate D/A conversion, the Formula xHD would seem the obvious choice. Case closed? Not quite. 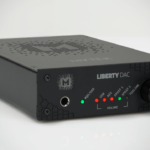 The pragmatist might point to the Formula xHD’s single utility as a DAC (and DAC only) and that the cost of a pre-amplifier must be factored into the purchase. The Chord DAVE comes with remote-controllable digital pre-amplification baked into its design, sidestepping the need for outboard volume attenuator and source selector (albeit with a minor hit to tonal mass) and associated analogue interconnect. More good news for the pragmatist: the DAVE’s compact form factor will see it go where the Formula xHD will not: onto the desktop where its 6.4mm headphone socket expands the Chord unit’s utility still further. The pragmatist might also draw our attention to the DAVE’s pair of TOSLINK inputs for TV and/or games console hook-up. Best is more than a matter of ultimate sound quality; functional breadth also informs our decisions. One reason why the DARKO DAC Index groups DACs according to sound quality and the need for third-party hardware and use case flexibility. What’s best? The question is a would-be shortcut to a destination that varies according to individual preferences — and not all of them relating to sound. Not every audiophile is an idealist pursuing a single goal. Many audiophiles are pragmatists, mentally weighing up objectively unquantifiable qualities like 1) functional deployment 2) aesthetic appeal and 3) total cost of ownership to form a more complicated, rectangular-shaped decision matrix. What’s best? It’s a question only you can answer.